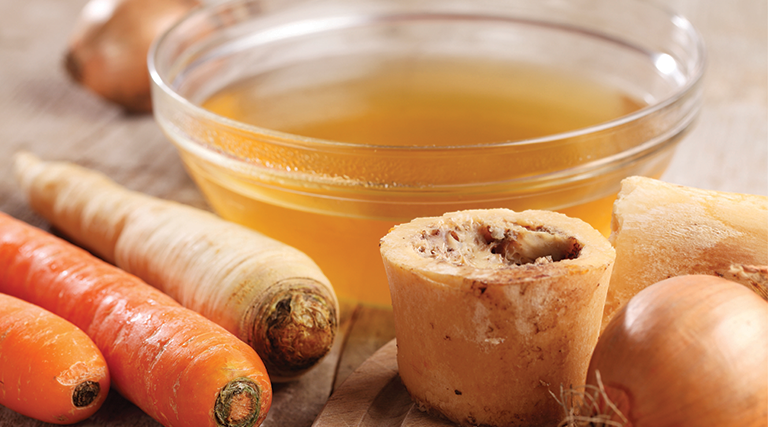 Bone broth, by definition, is simple to make: Bones plus water plus time is all that’s needed to concoct something not only delicious but healthy. Anyone down with a cold, flu, chronic ailment or injury can sense bone broth’s healing powers. For centuries, cooks and chefs have boiled the bones, cartilage, tendons, feet and knuckles from poultry, cattle, pigs, sheep and even fish to prepare a nourishing gelatin-rich liquid that soothes, hydrates and warms a body. Bone broth contains amino acids needed for the body to rebuild and repair itself and to boost immune function. Broth is also thought to strengthen hair, skin and nails; ease creaky joints, and—perhaps most importantly—heal and seal the fragile gut lining, reducing chronic inflammation and, over time, any number of autoimmune conditions. Deeply nourishing, broth’s beauty lies in its simplicity. Optional: Apple cider vinegar or fresh lemon juice: 1 tablespoon per gallon of water. The acidity helps release minerals. Place bones in your cooking vessel. (Note: roasting the bones before making broth adds a richer flavor but no added nutrition. Consider roasting if broth is the star of the show, like in a homemade pho, but for daily use, you can skip the extra step.) Submerge in water—at least 2 inches above the level of bones. Add vinegar. Season if desired. Cook according to the equipment used. Stock pot—Cooking broth on the stove works wonderfully if you have time to babysit your broth. Bring to a boil and then reduce to medium-low heat and allow to simmer a minimum of 8 hours. Slow cooker—The easiest, most inexpensive way to get beautiful broth. Set it on low and leave at least overnight. Simply top off with water before going to bed to assure water levels cover bones. Instant Pot/pressure cooker—A great option if you’re short on time. It makes a clearer broth that some feel doesn’t have the richness of slow-cooked broth. Cook according to manufacturer’s instructions. Season or not?—Chef’s preference! You can add seasonings and vegetables of choice to enrich flavor. Keep in mind sweeter veggies—like carrots—might become dark and bitter after hours of cooking. Onions, celery and garlic are recommended. Experiment with seasoning blends for variety. Quality salt is essential. Leaving your broth unseasoned simplifies the process and makes the broth more versatile; it can be custom seasoned to taste or to suit the cuisine that you are preparing. Also, when left unseasoned, bone broth is bland enough to use as a smoothie base—a clever way to get more broth into your diet. Strain your broth and place in glass jars for storing. Be careful freezing it, as even “freezer safe” glass jars break at times. Broth stores for weeks in the fridge; the fat that floats to the top creates a beautiful seal keeping your broth fresh and ready to use. You can skim the fat off or stir it into the broth as you reheat it. Save: Keep a container in the freezer for ribs, pork chop bones, chicken carcasses, etc., and when it’s full, it’s time to broth. Hunt and gather: If you hunt, save those bones; if you don’t, ask a hunter friend if they’d save bones for you. You might find a local butcher willing to give you bones or sell them to you cheap. I’ve found that drinking broth daily is a habit that pays dividends in overall health and vitality. I use it in soups, stews and sauces to cook vegetables, grains and potatoes. I also sip it like tea with my favorite seasonings. Once you take the leap, you will see lots of ways to get the good stuff in. Kristin Whitaker is a certified nutritional therapist in training through Nutrition Therapy Institute. She blogs at the LittlePurpleBarn.com and is market manager at Utah Natural Meats (7400 S. 5600 West, West Jordan, 801-896-3276, UtahNaturalMeat.com/education) where she sells beef and pork bones and offers classes on beginning bone broth.